Tagline- He’s Up Past His Bedtime in the City That Never Sleeps. In 1990 when Home Alone was released it became a massive success pulling in 285-million dollars in the US and 476-million worldwide and was the highest grossing film of 1990 and was also by far the biggest success in the career of the legendary John Hughes. Not only was Home Alone a massive success in terms of the money it made, but it also became a huge part of pop culture. 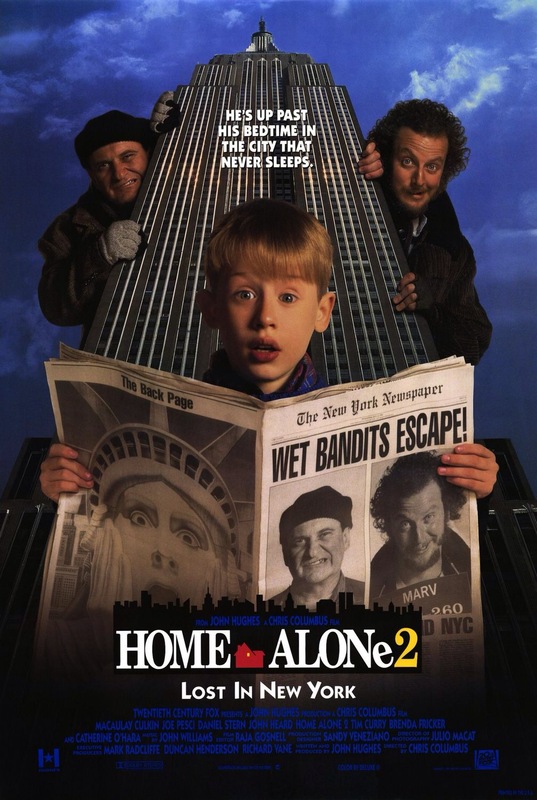 In 1992 Home Alone 2: Lost in New York was released and while the box office numbers dropped, but Home Alone 2 still was a major success making 173-million dollars in the US and 358-million dollars worldwide and was the 2nd highest grossing film of 1992 (Aladdin was the top grossing film). When it comes to sequels most aren’t nearly as good as the original with a few exceptions and while Home Alone 2 was an enjoyable film it wasn’t nearly as excellent as the original. As I’ve mentioned in other John Hughes productions he’s my film idol, but Home Alone 2 would in my opinion be one of his weaker films, but even a weaker John Hughes film is still better than the bulk of films by other writers. I think the biggest problem here is there really isn’t a reason for this film outside of existing simply because it could due to the success of the original film. In general even if really good most sequels really aren’t needed, but certain genres such as action and horror films due to their setup can generally work better with sequels since they both have a simple formula, but films such as Home Alone 2 in my opinion generally feel a little more forced. On a trip to Florida for Christmas the McCallister family is again late getting to the airport only this time they don’t forget Kevin (Culkin) however when rushing to board their plane Kevin gets separated and ends up on a plane to New York. Meanwhile during a prison riot Harry (Pesci) and Marv ( Stern) escape from prison and also are in New York and have another showdown with Kevin. John Hughes like any writer has a style, but each script by Hughes never felt like a rehash even though you know a John Hughes film when you see one. Hughes was extremely active in the 80s and even into the 90s before basically retiring. John Hughes could have 3 films produced a yearly, but quality never dropped, which is quite rare for someone as active as John Hughes and all his films follow the same structure even if as mentioned they never felt like a rehash and had their own identity. Home Alone 2 was released 2-years after the original, but the film itself is set a year after the original. The script by John Hughes while well written does however feel like a rehash of the first film and if anything its pretty much a rewrite and the John Hughes formula was perhaps wearing a bit thin. In the 90s, Hughes started to go in a different direction focusing more on family themed films and even though Hughes is my film idol I wasn’t really the target audience anymore. While John Hughes still had some quality films in the 90s perhaps the change of times and heavy workload caught up to him. Characters are solid, but don’t quite make the same impact as they did in past John Hughes films. There’s plenty of amusing bits as well as the typical heartfelt moments, but as states it feels too much like the original, which lessen their impact. With all that said though the script by Hughes is still quite entertaining and it is a solid script even if not on par with the typical John Hughes production. Director Chris Columbus returns for the sequel and while he makes a fun film, but like how the script rehashes the original the direction by Columbus also very much follows the original. Running at 120-minutes Home Alone 2 is a bit on the long side and the middle sections is where the pace can get a bit sluggish. Chris Columbus made a terrific film with the original, but Home Alone 2 is bogged down by offering nothing new. There are plenty of funny moments, but as a whole Home Alone 2 isn’t quite as fun as the first film as scenes from the original are more or less re-staged. While my review might sound negative, Columbus does craft an enjoyable film and with a bit of editing to tighten the pace Home Alone 2 would have been better served. The cast for Home Alone 2 is quite solid with appearances by Tim Curry, Rob Schneider, Eddie Bracken and a cameo by Ally Sheedy. Macaulay Culkin is fun to watch even if his scenes are basically the same as the original. Joe Pesci and Daniel Stern are again a blast to watch. Overall Home Alone 2 is a fun film, but it just follows the original film far too closely and it just lessens the impact. However its still an enjoyable and funny movie, but plays it far too safe. This wouldn’t be the end of the series as John Hughes would write a 3rd film, which was a box office flop and it still wouldn’t end there as there would be two more films only this time without John Hughes and were made for TV movies.